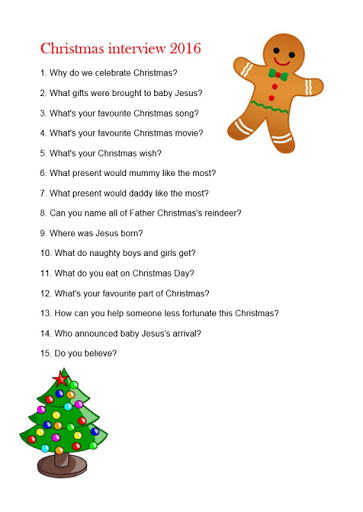 This year I thought it would be nice to 'interview' T about Christmas, what it means and ask him some questions. I decided to record this rather than fill in a form and I'm so glad I did, I just know that this will be a new tradition in our house for as long as he is willing! 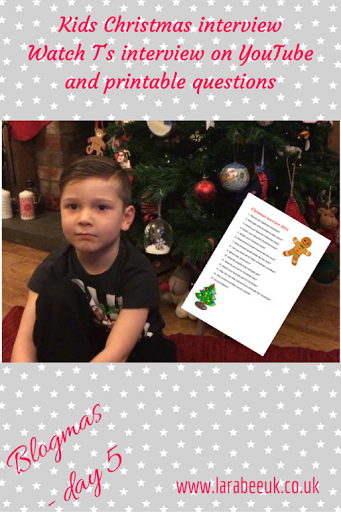 I kept the questions simple this year and purposely steered away from 'What would you like for Christmas?' As I'll be recording this elsewhere. 1. Why do we celebrate Christmas? 2. What gifts were brought to baby Jesus? 3. What's your favourite Christmas song? 4. What's your favourite Christmas movie? 5. What's your Christmas wish? 6. What present would mummy like the most? 7. What present would daddy like the most? 8. Can you name all of Father Christmas's reindeer? 9. Where was Jesus born? 10. What do naughty boys and girls get? 11. What do you eat on Christmas Day? 12. What's your favourite part of Christmas? 13. How can you help someone less fortunate this Christmas? 14. Who announced baby Jesus's arrival? We had a lot of fun doing this video and it was lovely to have Twiggy there too, even if she did scratch T! If you'd like a copy of our 'interview' you can download it here, we'd love you to tag us if you do it with your children.